Tazo Assorted Tea Sampler (Pack of 6). A Great Variety of Tea With Varying Levels of Caffeine, This Variety Pack Will Get You Through Your Entire Day and Night! Tazo Tea Sampler 6 Pack, Features 6 Varieties of Tazo Tea (Each Box Contains 20 Tea Bags). Tea Flavors Include: Zen, Passion, Calm Chamomile, Earl Gray, Awake English Breakfast, and Organic Chai. 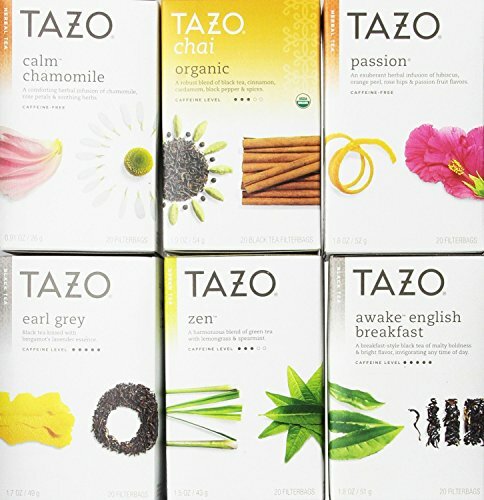 Locate Your Favorite Tazo Tea With This Sampler Pack.